For the sang, see Marvin Gaye (sang). 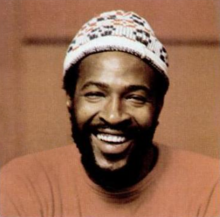 Marvin Gaye (born Marvin Pentz Gay Jr.; Aprile 2, 1939 – Aprile 1, 1984) wis an American sangster, sangwriter, an muisicker. ↑ Simmonds 2008, pp. 190–192. This page wis last eeditit on 16 Mey 2018, at 06:15.